Home ▸ News ▸ Withington are GCHQ CyberFirst Girls Competition Finalists! 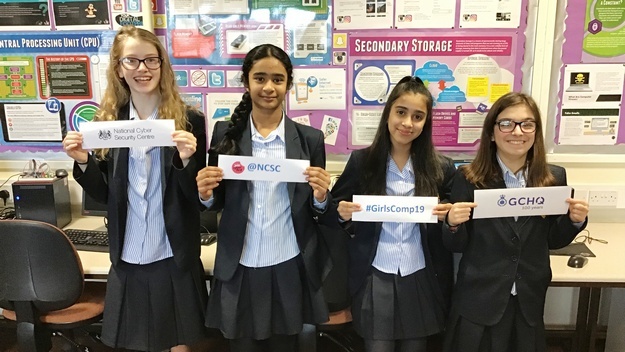 Four Year 8 pupils have won through to the final of the CyberFirst Girls Competition, a competition of problem-solving and code cracking challenges, organised by the National Cyber Security Centre, a part of GCHQ. The group were delighted to be judged one of the top ten in the nationwide competition involving over 3350 teams. The initial round of the competition involved taking part in an online challenge where they had to put their Cryptography, Cyber Security, Networking and Logic & Coding skills to the test and, now, as one of the top ten teams, they will go forward to the face-to-face final to crown the UK’s most cyber-capable young women, to be held in Edinburgh in March. This GCHQ led competition aims to address gender imbalance in cyber-security and it is bearing fruit with a record 12,000 participants in the 2019 competition. Currently, just 11% of the global cyber workforce are women. As an added incentive for all competitors, the NCSC will be offering around 600 free places on specially commissioned four-day CyberFirst Defenders courses in April and May 2019. These courses will be ‘all girls’ and a mix of residential and non-residential at locations across the UK.